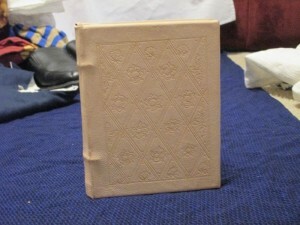 This is the fist leather book I have ever made. We had a local Arts and Sciences class on the topic and I purchased a kit. The class was well taught and I was able to complete my book. 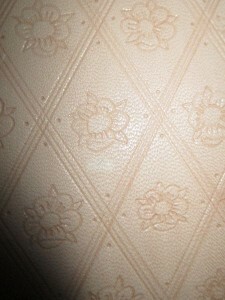 The cover is embossed with a pattern of strawberries and flowers. It will not be used as a child’s toy! My brother got his Laurel at Pennsic in 2014 and his Knighthood in January of 2015. I could not be happier, as I got him in the SCA and said “You have to do something more than just fight.” His Laurel ceremony was Tudor and I provided the book. It was the book pictured above.